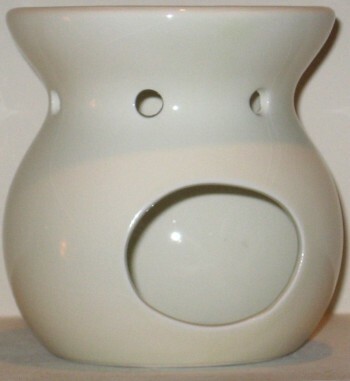 This aroma oil burner is ivory in color. It stands approximately 4 1/2" high and is about 4 1/2" wide at it's widest point. Tea light candle is included. Aroma oil burners are also known as tart warmers, tart burners, simmering pots, wax warmers, tea light warmers and potpourri burners. Fragrance oils sold separately in vial sizes or 1 oz. sizes. Place one vial (1.15ml) of fragrance oil into top of clean aroma burner. Light the tealight candle beneath it. You will start to smell the aromas as soon as the oil heats up. After 10 minutes, extinguish (blow out) candle. The scent lingers for a long time in the air. Caution: Never leave a burning candle unattended.